If your old sofa or chair looks as though it's on its last legs, don't be too quick to bundle it out of the house. The frame and its components are probably better constructed than the product furniture manufacturers produce today. More and more consumers live through the experience of investing in an attractive expensive piece of furniture only to see it thrown away after five years. Homeowners are discovering that many old pieces have a built-in value you can't buy today. 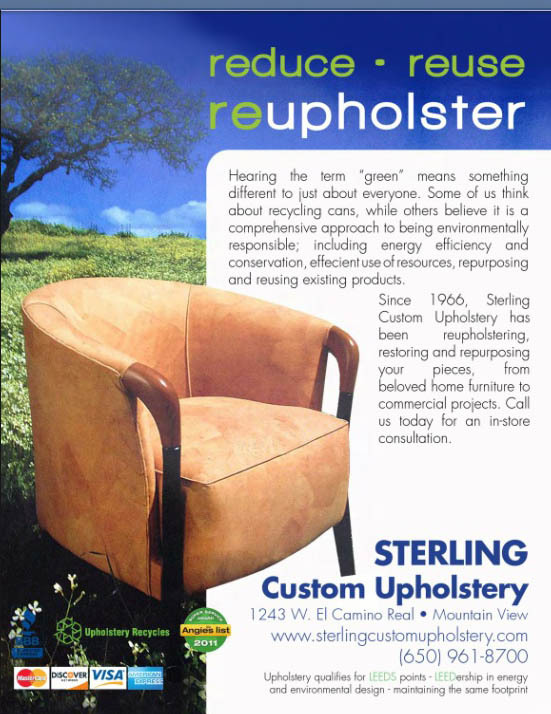 "People want a quality frame again," said David Cole, owner of Mountain View's Sterling Custom Upholstery Company. "They're tired of buying pine, plywood and cardboard frames. The trend is going back to something they can have redone more than one time." Beauty may lie in the eyes of the beholder, but Dave Cole just didn’t like what he saw while delivering food to volunteers staffing Mountain View’s Grant Road RotaCare Clinic. Patients waiting for medical treatment were sick enough without having dull and dreary furniture surrounding them, Cole thought. "There was this black, old tapestry … dark, dingy material," Cole said. "(The patients) don't feel well, anyway. I thought, 'I can fix it.'"